what kind of grass is this? - I'm wanting to plant low maintenance plants in a high planter box that will grow high and screen my bedroom sliding doors & is it safe for dogs? Thanks very much! Lemon grass is safe for pets, people use it in cooking..I make tea with it . awesome! do you keep the pots outside over winter? I live in PA and have lost pots to freezing. the weather here is mild, so they stay out all year. iowa...i take mine inside for winter..or set inside the shed..the ones i forget outside end up in pieces over winter. sad but true..cant remember everything when its buried in leaves from 100 ft tall oak trees and snow. Love these planters. Where can I buy them? These were found at Flora Grubb in San Francisco a while ago. Hi, Mark -- Can you help us identify the grasses in these containers? Thank you! Unfortunately, the landscaper gardener chose them, so I'm not sure. Show the picture to your local nursery. Try a good local nursery. Pots - where are those pots from? Where could I purchase the same ones? Hmmm. I know they are chinese manufacture, but I'm not sure where you'd find them. What color is the paint color of the siding? It's been a long time- it's a sage green variety. Another way to keep the wild shape of grasses in line is with planters. Here the planters and grasses are scaled so that they create a strong line and provide a screen that separates two outdoor rooms. Who wants a solid fence next to an entry door or a bedroom window? This soft, elegant solution is far preferable. 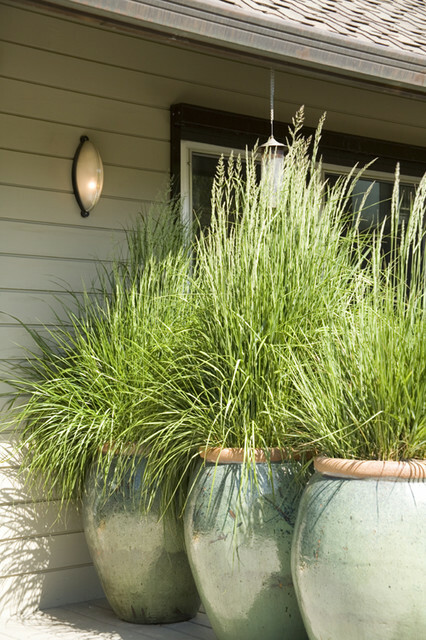 A trio of Ali Baba–scale pots, each planted with a stunning ornamental grass, creates a kinder, gentler barrier with style. Why not give some pots the prairie look? You could seed the containers, but buying some nursery plants might be best for you, so you get a quicker bang for your buck. Another planting suggestion: Have fun and design one container with some little bluestem (Schizachyrium scoparium) underplanted with purple prairie clover or dwarf blazing star (Liatris cylindracea). You might need to bring the container into the garage or shed for winter so the roots don't freeze or dry out, especially if you live in zone 5 or a cooler climate. 5. Movable barrier. Tall potted plants in the right spot can help create a visual separation between a public space and a private one, helping an entrance feel more removed from a busy street. Plus, they can be a useful solution for renters or anyone who is unable to build a fence or more permanent barrier. Design tip: Choose hardworking evergreen plants or large-scale ornamental grasses, rather than flowers, to act as a moveable privacy hedge. Taller containers and dense foliage can also help with some noise abatement. Add this, once the fence goes up! Movable barrier. Tall potted plants in the right spot can help create a visual separation between a public space and a private one, helping an entrance feel more removed from a busy street. Plus, they can be a useful solution for renters or anyone who is unable to build a fence or more permanent barrier. Design tip: Choose hardworking evergreen plants or large-scale ornamental grasses, rather than flowers, to act as a moveable privacy hedge. Taller containers and dense foliage can also help with some noise abatement. Flexibler Sichtschutz für Terrasse: Mit Chinachlif, oder Bambus? Need to buy some full grown lemongrass for patio. Lemon grass repels mosquitoes smells good.